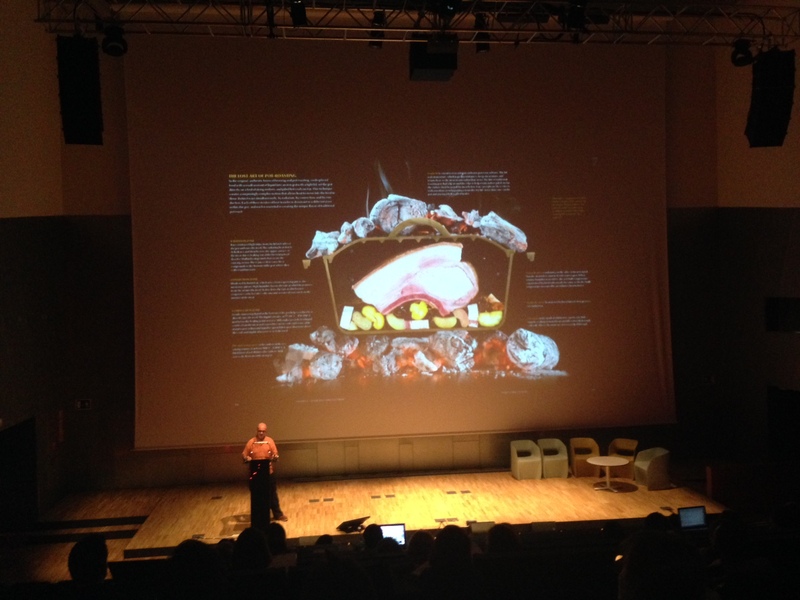 La Mandarina de Newton was very present at the ECSITE conference this year. As you know, ECSITE is the world’s most important association and meeting point of science museums and science centers. We promoted the organization of a specific session on co-production with users. We agreed with the various speakers and the convener, Holly Halsted, that, according to the values promoted by ECSITE a suitable title could be “The Democratic Exhibition: putting co-production first“. The session wanted to highlight the democratizing potential of opening to the public the process of production of content, activities, exhibitions and even the design of the organization of a museum or science center themselves. We did it, as always, from a constructive and constructionist perspective, that is, by referring to design and joint exploration practices. Suzy Antoniw, from the Science Museum in London who explored and explained how they had built with the affected community different exhibition modules on gender, and transgender communities and communities under risk of exclusion. Åsa Lindgren, from Tekniska Museet-Teknorama, Stockholm, who showed how they worked following a user-centered design strategy to co-create and co-design the new museum that is not yet open. Matteo Merzagora TRACES / Espace des Sciences Pierre-Gilles de Gennes showed how they launched a project on science and humor in the form of fully emergent exhibition. For our part, we showed how for us, La Mandarina de Newton, co-creation and co-production processes are not only building and community building but mainly processes where participants learn, transform themselves and the own institution. The session was an excellent occasion to strengthen the connection with these professionals. We recognized ourselves as interested in a similar vision of the relationship with the public in a more active way, and started thinking on further collaboration. 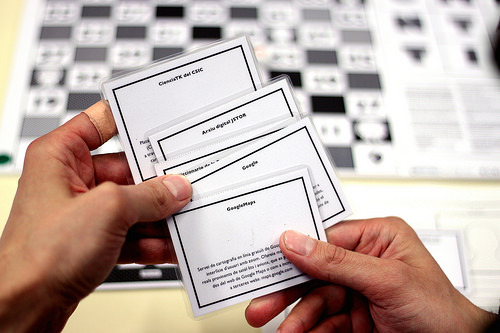 The issues of co-creation and co-production also appeared in other sessions. 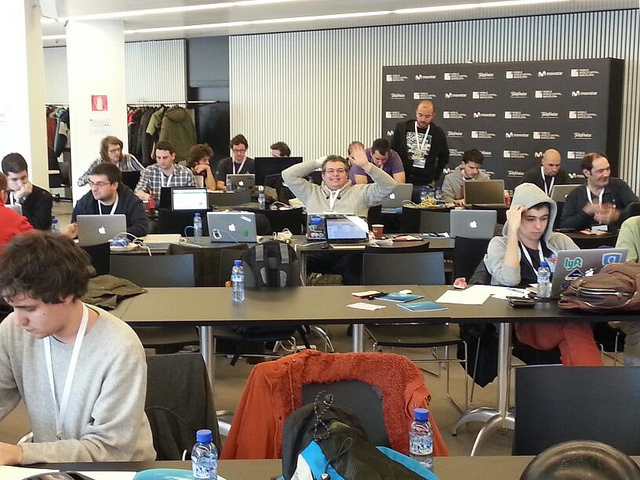 In particular, there was a continuous session devoted to making, 3D printers and other technologies. There, practical ways to create the basics of making a space in a museum or science center where practically discussed. There were examples interesting processes basically influenced by the vision of Tinkering according to how the Exploratorium has implememented. Let’s not forget that the Exploratorium is an institution with a strong dominance of the science museum and science center domain and that it was leading this session. 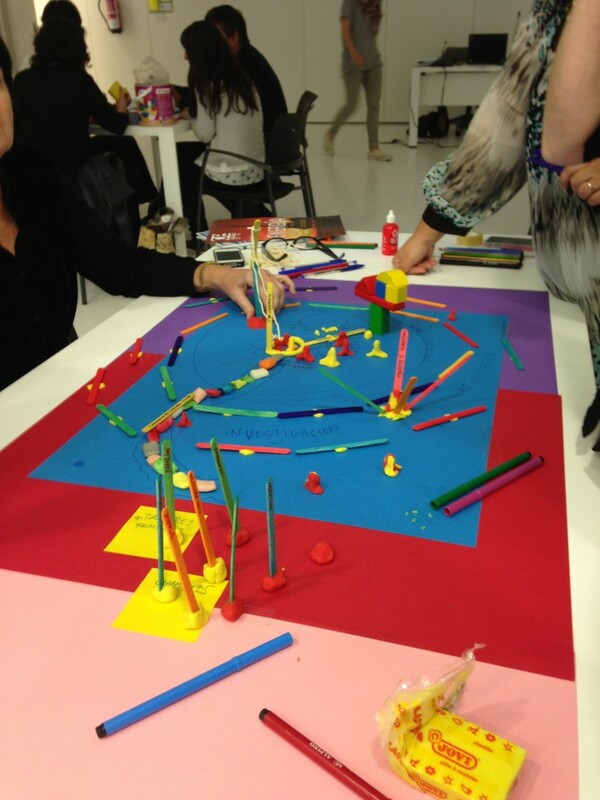 We also saw many experiences of prototyping exhibition modules specific to certain areas of museums. They showed a certain openness with respect to the usual processes of a museum but we had the feeling that users were still seen, in general, more as components of “user groups” than as genuine co-producers of knowledge. Still, it is an interesting trend that was fully discussed in the session about “makerspaces” and hackspaces where a significant predominance of American experiences could be seen as well as counterpoint to the Science Gallery in Dublin that seem to try to place itself “au dessus the melee” but opted for a concept, for us, it is arguable in this context as is the center as a “living lab”. Another form of participation that was the focus many presentations was that showing to the public the “backstage” of exhibitions and museums: how they are organized, how they are constructed, etc. This is a line we have also seen in the world of art institutions. There was no lack of projects under the “Citizen Science” umbrella. It is clear that this type of projects that are booming although there is a majority of them which are very focused on seeing the citizen as sensor and data collector. There are only a few projects where participants have a deeper role. But, no doubt, this is another “trend” in this sector. Finally, another area of interest was the one that is emerging around the movement for responsible research and innovation. Museums and science centers are proposing themselves as “neutral places” where a new connection between the will of citizens and scientists and technologists could be activated: what is known as Responsible Research and Innovation. The European project “Responsible Research and Innovation Tools” uses years of research from the social sciences and the of Science, Technology and Society Studies to derive good practices in Responsible Research. 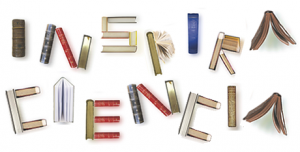 Other projects where more specific and focused on areas such as neuroscience. The Responsible Research is a line in which we are interested, and to which we will return. 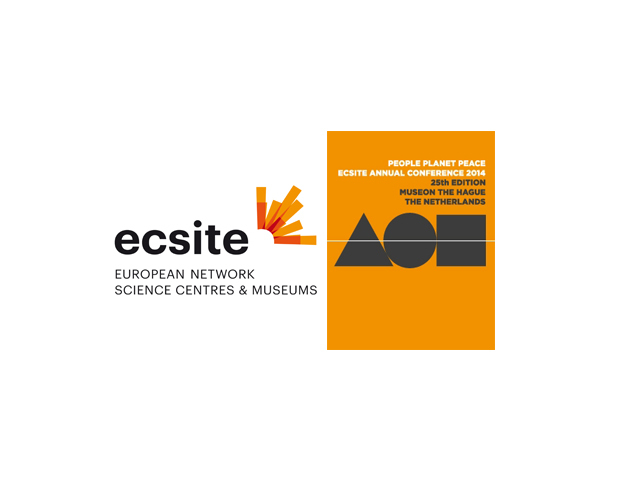 Science museums and science centers emerged in very specific socio-economic and political moments, with a requirement to promote a favorable view of science under innovative formats. Now they are trying again to reach the public through new channels such as making or gamification. We will see if these processes are eventually trivialized as new ways of “selling” the techno-scientific idea, or they are harnessed to generate knowledge by truly listening and co-producing with citizens. Co-creation is learning, as we said at the meeting and as we continue trying to show each day. 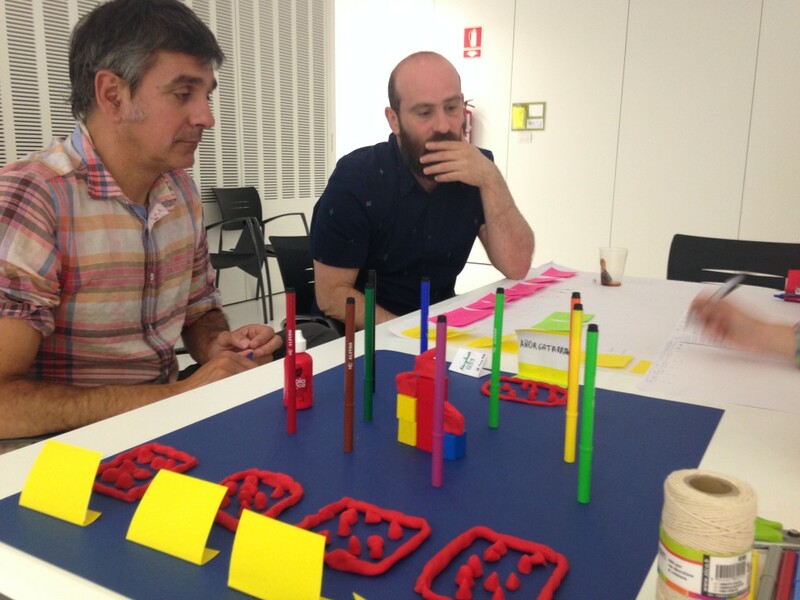 The co-creation project TalentLab that we developed with Delegation in Catatonia of the Spanish National Research Council (CSIC) has entered its third year. This time we did a review of all the educational materials that were co-created between scientists and secondary school teachers in the previous two years. To start with, these educational resources were shared with new teachers in several workshops so that they could explore how to apply them in their teaching. 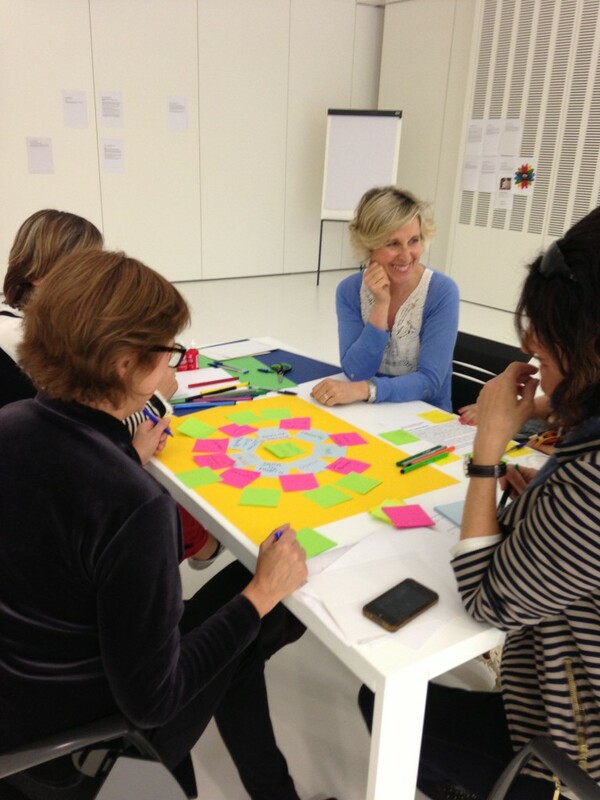 Also this year a set of dialogues has been organized to complement the topics that were discussed at the co-creation workshops at the origin of the Talentlab exhibition that we created ​in the second edition of Talentlab. These dialogues, in a conventional museum, would act as the activities that would complement the main exhibition. This Talentlab exhibition is right now open at the Espai Mandarina. CSIC scientists who are doing actual research on the topics of each dialogue, discuss their work with people closely related to the motivations and effects of these synergies as well as with social scientists. And with the general public, of course. In each event, a wide range of skills, interests, and critical perspectives arises. We tried to motivate these synergies by a first exposure to a new object, or landscape or body that have been hybridized by the intervention of human science and technology developed at a given time under the influence of specific cultural relations and power structures. At the end of each dialogue we facilitate a fast workshop with the attendees in order to capture their interests and to figure out new questions that have arisen after the discussion. One outcome of the project will be precisely to compare the perceptions and desires of each type of participant about the topics covered in the cycle of dialogues. The three talks scheduled for this year connected “an object, a body and a landscape”. Each one explores examples of the interaction between objects, bodies, landscapes and the technosphere. The second dialogue explored how the concept of the body has been altered since the arrival of the Cyborg. 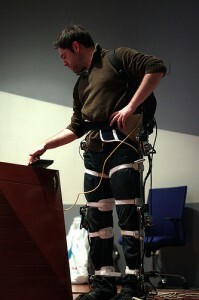 We opened the discussion by presenting the exoskeletons developed by CSIC scientists. In this video you can see Guillem Alenyà of the Industrial Robotics Institute (IRI-CSIC-UPC), Antonio Centeno of the Independent Living Movement, and Josep Martí, of the Milà Fontanals Institute of CSIC, discussing issues related to body and technology. As soon as we can, we will share with you the results of our analysis of the contribution of the participants and interventions, both the public and the scientists. We already can advance several key points that have appeared again and again in each dialogue. The ever present dilemmas about the separation between the natural and the artificial, the natural and the cultural as well as the fears and enthusiasms associated with the ability to influence nature. Other recurring questions have to do with decision making. Who decides what to change and why?. What degree of autonomy, if any, should be given to advances that question the common divisions between the natural and the artificial or the human?. How to manage these decisions in a democratic society where the rate of change in technology and science is so fast as nowadays?. What appears increasingly clear is that the participants believed that the feedback between the natural and the cultural feedback is more and more quick and strong. The cyborg, for example, goes far beyond the simple prosthesis since it makes decisions for us. It also seems that participants understood that nature is conformed by something different than a purely natural process of evolution and cannot be understood without human decisions. The latter influence nature in a way that is increasingly amplified by our own technological capabilities. Year after year, this hybrid nature is more and more human. Humans increasingly evolve towards a natural that is the result of our own hybridization which, in turn, is decided by those who have a specific kind of power but not by the entire population. The next dialogue will examine how a landscape is transformed by an event as traumatic as the accident of Fukushima nuclear plant in Japan. It will take place on June 16th. 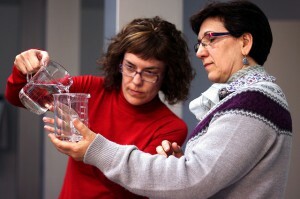 Like all previous dialogues the meeting will be at the CSIC residence of researchers in Barcelona. 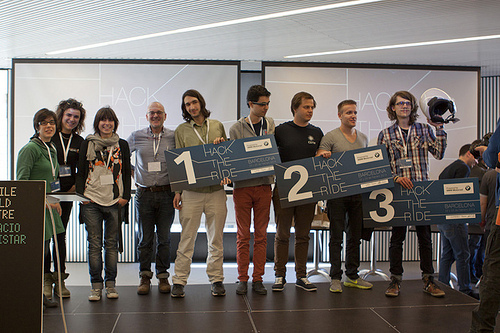 Recently we delivered the final prize Hack The Ride to Miquel Llobet and David Farrús, members of the WMB team who were the first prize winners of Hack The Ride with a proposal based on Google Glass that integrated data from the bike while you drive and you can request more or less information from the controls of the bike. 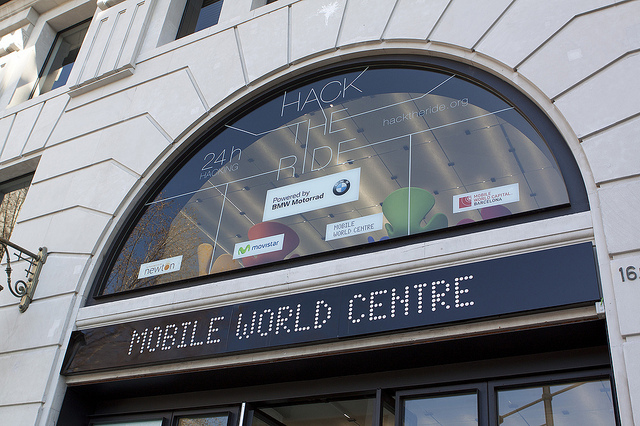 It was the first of three prizes to be awarded at the end of 24 hours of Hack The Ride, a hackathon we organised for/with BMW Motorrad and the global BMW Innovation Group (Innovation Works). The idea was to create new applications for mobile phones and similar devices to improve motorcycle driving in town. It can be understood as the application concept “Connected Vehicle” to mnotorcycles. The “Connected Vehicle” was also one of the important themes of the Mobile World Congress this year. We took the Mobile World Center at Plaza Catalunya during the 22nd and 23rd of February. BMW showed and shared the workings of their new c-evolution electric motorbikes which come with an interesting set of sensors and systems for collecting and sharing data. 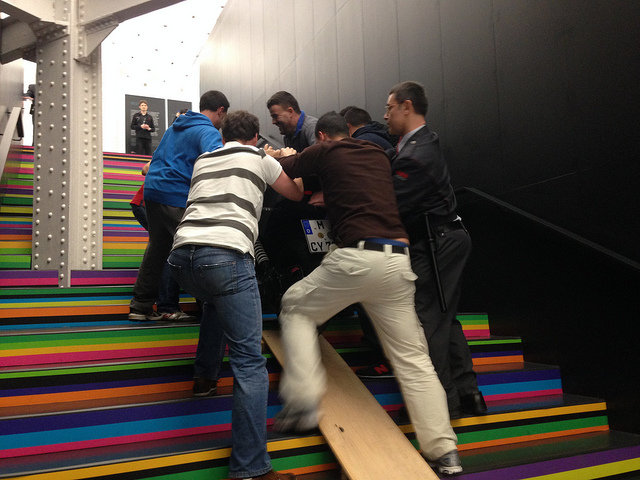 It took a bit of work to get the bikes to the second floor, though. The UNU team, GillesBackhus and Robert Weindl, who presented the application Bike Share. It is a system that facilitates motorcycle sharing among a community of bikers. This is accompanied with the ability to measure the confidence of the people lending or borrowing a bike (using a graph-based algorithm) and also proposed interesting ways to visualise the approaches on the use of motorcycles in the city. It also overcame the “cold start” typical of collaborative environments with various incentive schemas. Paul Günther of the Gumball team won the third prize. His proposal used iBeacon by integrating the technology in the bike and letting other people access the history of a bike that they could come across on the street. Foe example, you could know the type of routes it did and, from here, you could connect with the owner and eventually agree to be borrow the bike. The most striking part of the proposal was whoever shared the bike through Gumball could customise it (lights, colors, etc.) and return it back later with the original appearance. Paul showed what use could be given, for example, to an e-ink technology . The BMW Flow team (Josep Jordana, Javier Arturo Rodriguez and Jordi Soucheiron) Proposed and application consisting of two parts: a mobile application that collects data from the bike and send them to the cloud and a web interface that allows you to see in realtime changes in the variables of your motorcycle. This web interface interface includes an API that allows the user or third-party applications obtain historical data of the motorcycle. Internet of Bikes (Oriol Fernandez) It is and application connected to the concept of Smart City. It uses the bike sensors and a smartphone. It sends the information to the cloud to provide real-time information on several conditions: weather, temperature, light, etc. . Combined with information about the city it suggest to the smartphone/motorcycle how to drive in a efficient way. The Butun team (Marc Felip) proposed a solution based on sensors that allows you to measure and improve your competence as a driver. The Social Pictime team (Juan Cruz, Guillermo Perez and Josep Romero) proposed an approach to social media to support a “fan club ” who shared information with members of the BMW community by creating a system of incentives and credits that has as prizes a way to access renowned pilots and to interact with them. This could also share pictures and other media. 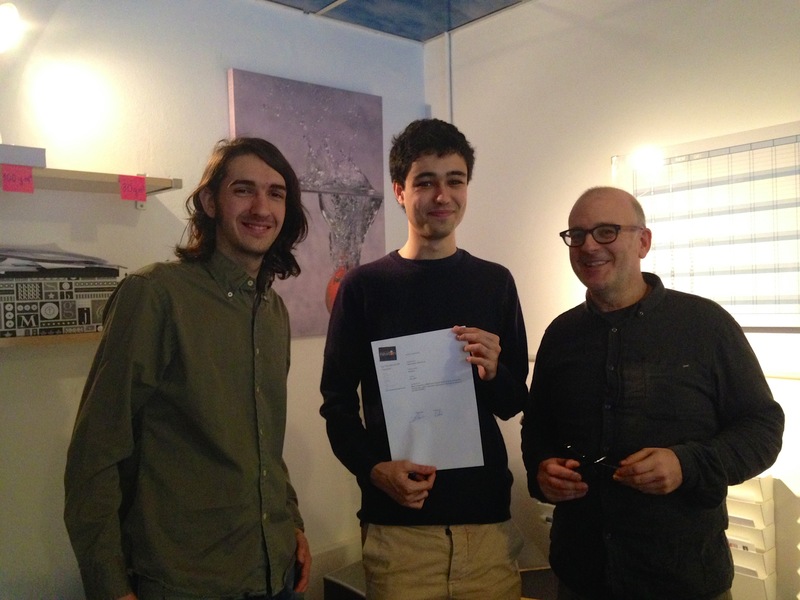 Team Mobile Airborne Division (Noel De Martin , Sergio Sánchez, Nelson Melina and Carlota Royuela) proposed the application ZenCat an anti-theft system based on converting the bike into a node of a network of “internet of things” . Jokin Cuadrado and Javier Serna proposed RideWithMe a system to support communication between riders to share routes on the fly. Markus Fisch proposed an apparently very simple application: a way to count the mistakes that are made while driving and to know what needs to be improved in the drivers way of piloting. The Eco Team (David Torguet García, Diego Morales Gómez, Rubén Sánchez, and Raimon Ràfols) proposed a constellation of applications (EcoWallet + Eco2mmunity + EcoGlass ) also made ​​use of Google Glass. The goal was to create an environment and incentives that favoured driving in a more environmentally conscious way. 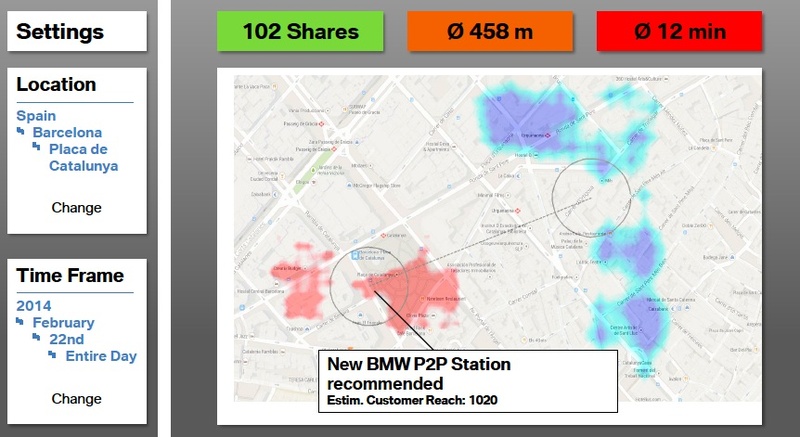 The team Synthesizers * (Horacio Herrera, Ricardo Caballero and Oriol Capdevila) proposed “BMW Experience” an application that facilitated understanding what the BMW driving experience by sharing places and routes . The Alergics team (Bernat Borras, and Adria Berge), proposed Ascure, an Android application, to provide security: it allowed you to query and modify the state of the bike remotely and to detect when someone is moving it without your premission. It provided the ability to alert the police or other security services. The proposal imesh by the MadGeekLabs team (Alejandro Vidal, Gustavo Giudici, Sanja Zakovska and Carlos Jimenez) uses Bluetooth to create a mesh network. This aimed , in part, to create a network for emergency but also to facilitate connectivity between conductors while driving. Other equally interesting use cases were proposed. Check & Ride, a proposal of the Motoapp team (Pol Montserrat. Erik Podetti and Carles Farrerons) monitors data from the bike and other sources (like the city) to detect anomalies that may affect driving and proposes solutions to the driver. At the same time, it seeks to reward good drivers. The WOOW team (David Alvarez, Cristian Lopez and Marc Gibert Grau) come up with The Guard, a system for detecting lost or stolen motorbikes by exploiting a network of distributed mobile applications. The Solarriz team (Jordi Aranda, David Solans and Borja Gorriz) created Follow Me. This is an Android application that allows each rider to share his or her route and position via a web link or a direct connection. 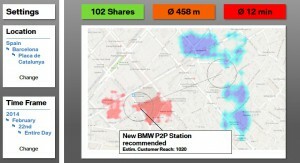 Safe Rider was the proposal of Toni Cañas Guillen whose goal was to manage various BMW scooter by focusing on the interaction between the motorcycle data and weather conditions to create safe driving. The Tecnoria team (Luis Miguel Gil) created ecall moto, an application that evaluates whether a motorist has had an accident by integrating data coming from existing sensors, GPS and other technologies. If so, the application launches communication actions to appropriate services. In brief, a lot of creativity to meet the challenge of improving the urban experience of driving motorcycles. In the exchange we had with participants we discovered things we did well and others that need improvement for future editions. We know that the food had many compliments but we also know that we have to improve the management presentations. In particular the time allocated to each one of them and how to make the best demos. Thanks to all for the suggestions, appreciation and criticisms!.